A few months ago, American Greetings and Just Play re-launched some of the most iconic weirdo toys from the '80s. 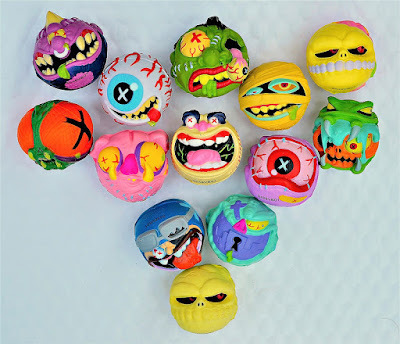 Madballs are back! 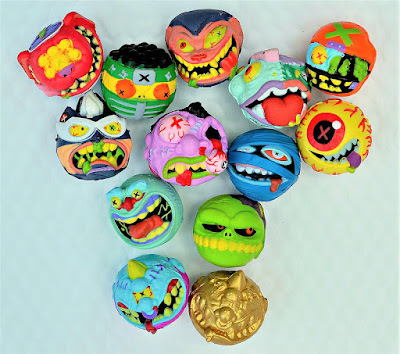 The new Madballs have hit store shelves (Target, Wal-Mart, Toys R Us) in two different sizes -- a standard size that's in line with vintage Madballs, as well as a mini size that measures a little over one inch tall. This post will focus on the minis. Even though they're small, the Madball minis are made of the same squeezable foam used for both the vintage and new standard-size balls, and include fully painted details. 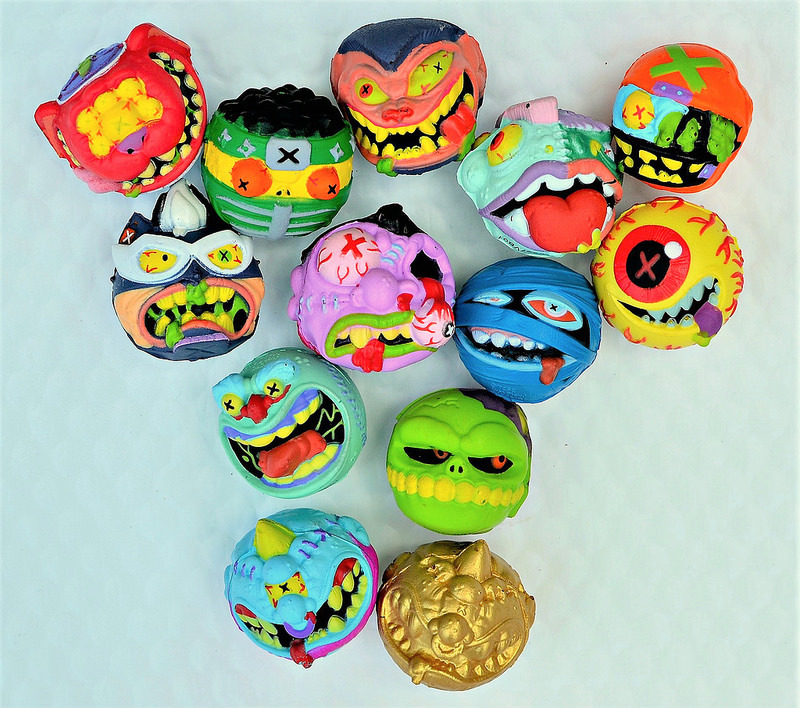 They are sold in secret blind bag packages, with two different series released so far that each consists of 13 different Madballs. 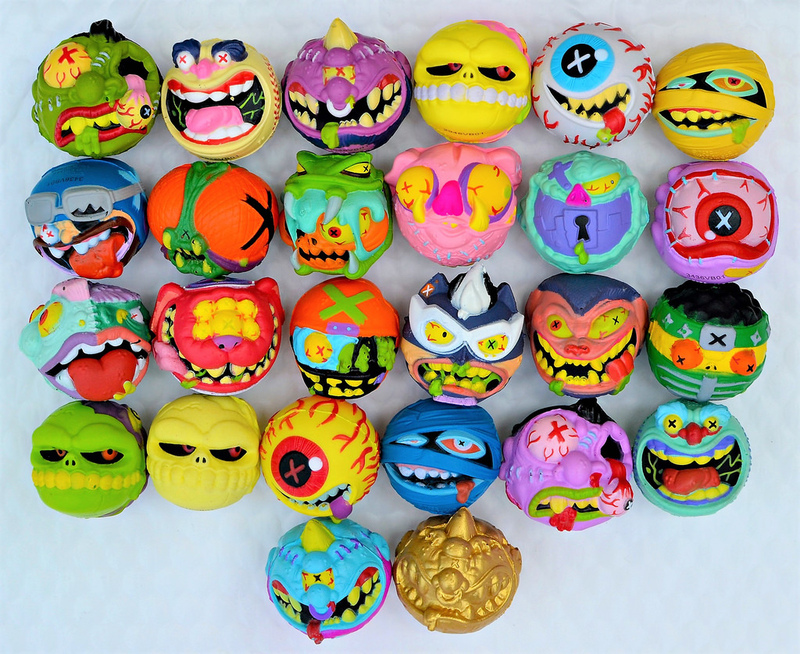 So, there's currently a total of 26 different mini Madballs to collect -- 18 are unique characters/sculpts and the rest are "Mix-Ups," which are some of the same characters repainted in different colors. Design-wise, the new Madballs look more cartoonish than their vintage counterparts, which works better on some characters than others. Some of them, like Slobulus and Horn Head, look pretty similar to their '80s versions, while others, like Lock Lips and Snake Bait, are completely re-imagined. Overall, I'm quite pleased with them and prefer to have designs that have a new spin rather than simply re-hashing the same vintage looks. 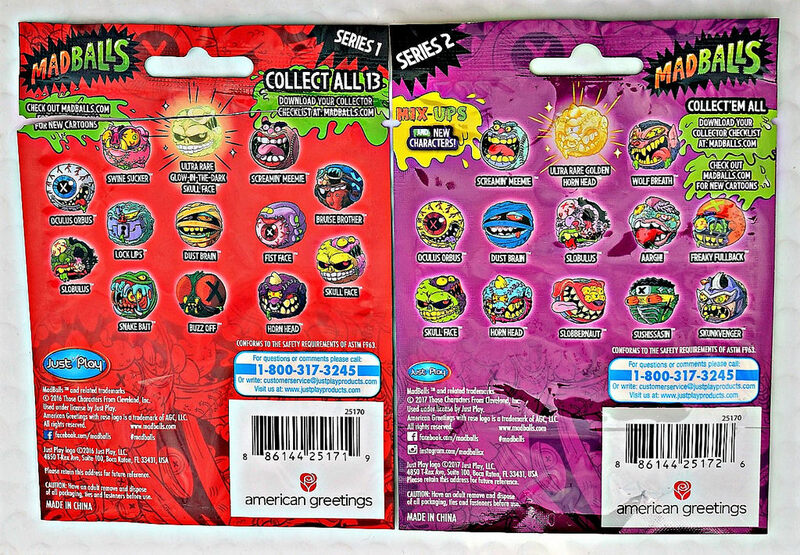 Series 1 was released in two different batches, with 7 coming first (Horn Head, Dust Brain, Screamin' Meemie, Slobulus, Oculus Orbus, and 2 different Skull Faces) and the additional 6 following shortly after (Swine Sucker, Lock Lips, Bruise Brother, Fist Face, Snake Bait, and Buzz Off). The later 6 have been tougher to track down in most areas. The "chase" character from this set is a glow-in-the-dark version of Skull Face. Series 2 expands on the first set with 6 additional characters (Freaky Fullback, Slobbernaut, Skunkvenger, Wolf Breath, Aargh!, and Sushissasin) and 7 repaints of Madballs from Series 1. This set's chase ball is a monochromatic gold Horn Head. 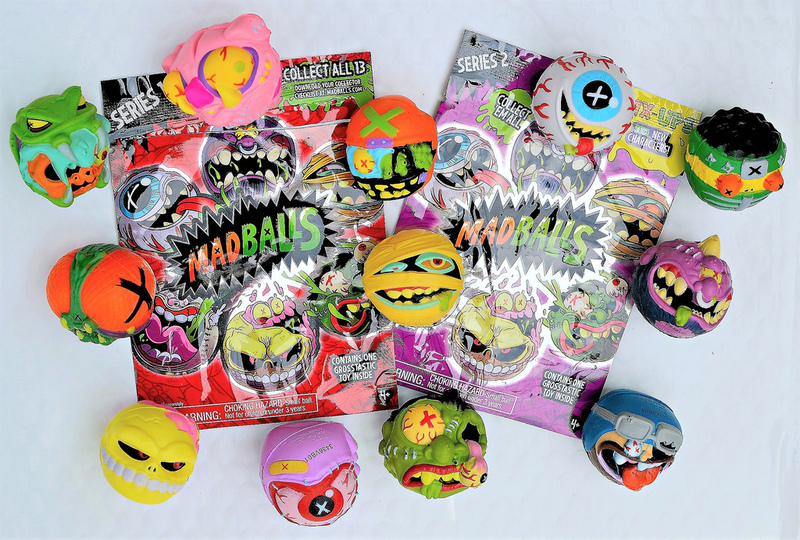 Madballs are absolute classics and it's good to have 'em back! What do you think? Have you picked any up yet? 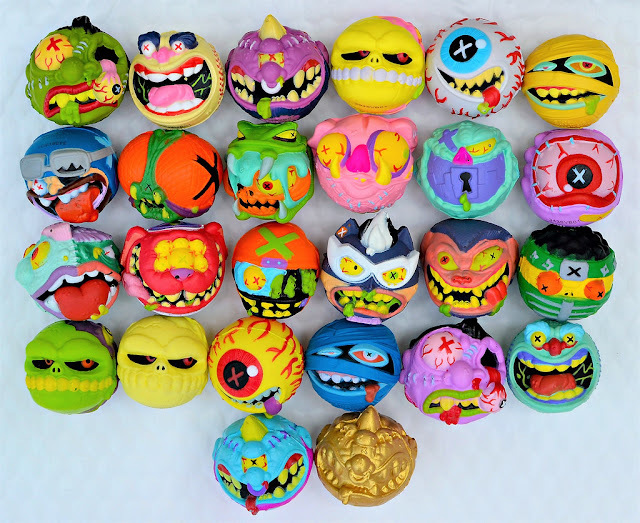 You can check out the official site of the relaunched Madballs at Madballs.com. Ah! You have added some color to your line-up, yes?